The most common police speed measuring devices are radar and lidar. Radars use microwaves, and lidar uses pulsed infrared (IR) laser light radiation, to measure target reflections to determine speed. Lidar is also referred to as Laser Radar. Radar and lidar are accurate to plus or minus 1 mile per hour (± 1 MPH). Moving mode radar is accurate to ± 2 MPH. radar (rã´där), noun. (1) acronym for RAdio Detection And Ranging. (2) a remote sensor that emits electromagnetic radio waves, microwaves, or infrared laser light in order to measure reflections for detection purposes such as presence, location, motion, speed. (3) radiolocation. (4) field disturbance sensor. (5) proximity sensor. Police microwave Doppler radar transmits while simultaneously receiving reflections from moving objects. The reflections are frequency shifted by the Doppler Effect and proportional to speed. The radars must dwell (sample period) on a target about a quarter to a third of a second to get one speed reading [Timing Animation]. Typically multiple sample periods are required when an echo is first detected, longer range targets, or if the radar has just started transmitting. Police radars are available in 2 basic configurations, hand-held or fix mounted. Operates from a stationary position. Transmits continuously or on command. Measures 2 targets, fastest and strongest(3). Moving mode radars come with a patrol car mount for moving mode operation. Some radars measure approaching and receding traffic at the same time. Some, but not all, radars indicate traffic direction ("+" for approaching and "-" for receding traffic). All radars have an audio tone that indicates direction. The strongest target reflection is usually the closest, but not always. Moving mode measures on-coming traffic. Front antenna / inside patrol car. Measures 2 targets, fastest and strongest. Moving Mode measures same-lane traffic. Microwave radar radiates a cone shaped beam that has a relatively wide beam, 9° to 25°, that easily covers several lanes of traffic at a relatively short range. Target detection range depends on radar frequency and power, angle to target, antenna factors, and weather. Larger targets will be detected at longer ranges, usually. Target size, shape, and reflectivity effect radar detection range. Detection range can be as low as 100 feet or less to over a mile. A radar may track a distant large vehicle instead of a closer small vehicle without any indication to the operator which vehicle the radar is tracking. The angle between the radar or lidar and target must be small for an accurate speed measurement. The angle is referred to as the Cosine Effect angle because measured speed is directly proportional to the cosine of this angle. The larger the angle the lower the measured speed. As a target approaches a radar the Cosine Angle gets larger, and gets larger faster. Speed drops faster. When speed drops too fast the radar/lidar loses track and the target is in the radar's Blind Zone. A radar in moving mode can measure target speed high in some situations due to the Cosine Effect. This occurs when the radar measures ground reflections off angle, causing the radar measured patrol speed to measure low by the cosine of the angle, and target speed to compute high. This situation occurs enough to have a name -- Patrol Speed Shadowing. Most radar and lidars have a timing mode that allows the operator to time targets. The operator measures the time it takes a vehicle to travel between 2 points of known distance. The radar is not transmitting rendering detectors useless. This method is less accurate, takes more time to set-up, requires more operator actions, is less versatile, and thus used less often. The Federal Communications Commission (FCC) has allocated 4 frequency bands for police radar, X, Ku, K, and Ka. The first police radars transmitted in the S-band, not used for radar anymore. Today numerous wireless systems operate in S-Band. In 1947 Automatic Signal Company in Connecticut built one of the first traffic radars for state police. Early radars were bulky and heavy systems, vacuum-tube technology. The radar consisted of 3 or more large components, an antenna, a 45 pound box with transmitter and processor, and an ink pen strip chart paper recorder. The radar also had a needle meter calibrated in mph. Some systems had 2 antennas, one for transmitting and the other for receiving. The antennas were mounted on a tripod, patrol vehicle hood, or fender. Some of the early 1960s' models mounted the antennas in the back windshield of the patrol car. The first traffic radars transmitted at 2.455 GHz in the S band (2 - 4 GHz). The antenna beamwidth varied from 15 to 20 degrees depending on model. These radars operated from a stationary position only and measured receding as well as approaching traffic to an accuracy of ± 2 mph. The maximum detection range was an unimpressive 150 to 500 feet, vacuum-tube receivers do not have the sensitivity of solid-state receivers. S band radars are obsolete. Only a few states and places still use X-band radars, which have been around since 1965. All X band radars operate on a single 50 MHz channel, 10.525 GHz ± 25 MHz. Radars in the X band have better all weather performance, less signal loss in bad weather than higher frequency systems in Ku, K, Ka, and infrared bands. X-band radars tend to have slightly wider beams and larger antennas. Some European countries use X band traffic radars that transmit at 9.41 GHz or 9.90 GHz. The FCC has allocated 13.45 GHz in the Ku band for traffic radar use, however Ku radars are not sold or used in the U.S. Some European and Middle East countries use Ku band traffic radars. K band radars have been around since 1976 and operate on a single 200 MHz channel (± 100 MHz). Transmissions at 24.125 are lower power than at 24.150 GHz. These radars generally have more narrow beams than X band radars, and slightly wider beams than Ka band radars. Detection range decreases with moisture. The water vapor absorption band is centered at 22.24 GHz, signals in this band tend to become absorbed by moisture in the atmosphere. For short range applications the effects may be tolerable on relatively clear dry days. In 1983 the FCC allocated the spectrum from 34.2 - 35.2 GHz for police radar use. That same year Across-the-Road Ka band photo radars started appearing in the United States. 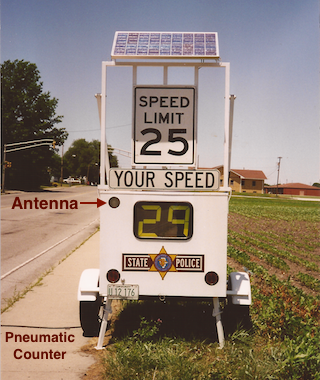 Nine years later in 1992 the FCC expanded the Ka band spectrum for police radar to 33.4 - 36 GHz. Ka band radars typically have more narrow beams than X or K band radars. Detection range depends on moisture in the atmosphere, the more moisture the shorter the detection range. Many models have a channel bandwidth of ± 100 MHz, a 200 MHz wide channel. Some models have a bandwidth of ± 50 MHz, a 100 MHz wide channel. The Ka-band has multiple channels (frequencies). Most Ka band police radars operate on one frequency channel, a few have 2 channels an operator can select. Wideband Ka radars operate on a single fixed frequency, or hops between one or more other frequencies. In frequency hop mode the radar dwells on one frequency for one or more sample periods then switches to another. The frequency hopping mode is intended to defeat radar detectors, however is seldom if ever used due to problems to numerous to mention. Only a few radar models have this mode. 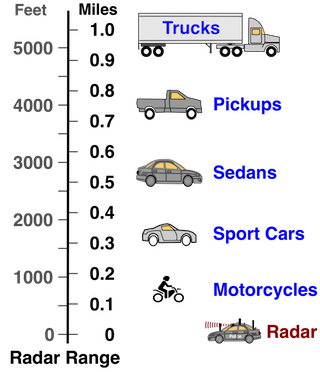 Police Radar Frequencies used in the U.S.
Photo radars are Across-the-Road microwave (K or Ka Band) radars that intentionally aim a narrow beam across the road instead of down the road. The main beam of the radar radiates only a very small segment of the road. These systems account for the cosine effect angle and adjust measured speed upwards 6% - 9%. Across the road radars are inherently less accurate than down the road radars because the beam is angled to traffic direction. The angle causes the Doppler reflection to spread out as a vehicle passes through the beam, a built-in speed error. At speeds as low as 20 mph the speed spread is 6 mph, the faster the speed the greater the spread. Additionally, target vehicle wheel rotation spreads the reflection even more. The radar attempts to process out the spreads, but there still exists more uncertainty and chances for error compared to Down-the-Road radars. Photo radars can be mounted in patrol vehicles but can only be used from a stationary position. Many are fix mounted to poles, some are portable units that use a tripod mount. Some are disguised as a trash container, billboard, or other common object. Photo radars have also been hidden in highway maintenance and construction vehicles, tractor-trailers, box trucks, and unmarked passenger vehicles including vans. Photo radars must be properly aligned to the road for the radar to correctly process the cosine effect. If the alignment angle is shallow measured speed is high, if the angle is large measured speed is low. 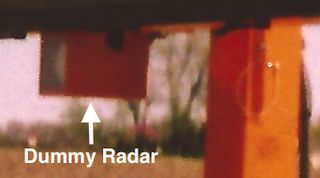 Most if not all fixed mounted photo radars operate unattended, no police officer or operator present. Mobile photo radars can operate either unattended or attended. In unattended operation the radar is constantly transmitting. When an operator is present the radar can run all the time, or the operator can use the instant-on feature to transmit only on command. Violations are photographed and superimposed with speed, date, time and location, and mailed to vehicle owner. Photo radar setup to measure approaching traffic gets the front license plate, the driver may or may not be identifiable. Some systems take a second photograph to get the rear license plate. Photo radars, or camera radars as they were first called, were in experimental stages of development as early as 1954 using S band radars. In 1983 the state of Texas tried a French-manufactured Ka band radar for a time but discontinued its use because the units were being stolen right off the road. Many communities use photo radar because of the revenue it generates, some communities have outlawed photo radar because of public pressure. 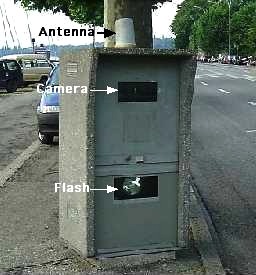 Dummy radars are unattended stationary K-band transmitters intended to setoff radar detectors. The Dummies do not have receivers and cannot measure speed or anything else. Common locations include heavily used highways and construction zones. Common positions include mounted to an overhead highway sign, and portable message signs. Safety radars are across-the-road radars that measure speed of approaching traffic and display the speed to alert drivers how fast they are traveling. These radars are constantly transmitting. Most safety radars display all speeds measured, some flash speeds above the limit, some only display speeds above the limit. Many safety radars do not record anything, some record all speeds (and time and location), and some only record speeds above a preset limit. 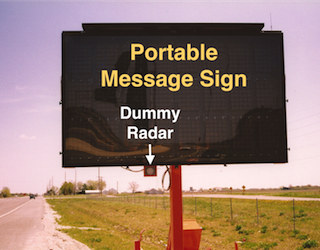 Safety radars can be built into small portable trailers, larger trailers with larger displays, made in the shape of various road signs and other objects. In the United States most operate in the K or Ka band because the X band is overcrowded. Some across the road radars do not display speed but do record speed, date, time, and location for traffic studies. The radars are constantly transmitting, and measure approaching and/or receding traffic. The purpose of traffic study radar is not to issue tickets or show speed, only to estimate traffic speeds on a given road at given times. Sports radars are intended to measure the speed of anything that moves and is reflective -- baseballs, hockey pucks, golfballs, cars, birds, raindrops, etc. Sports radars radiate less power than police radars, and do not require an FCC license. Most transmit in the K-band at 24.125 GHz ± 125 MHz, some transmit in X-band at 10,525 GHz ± 25 MHz. A sports radar will setoff a radar detector, and produce a police radar false reading if the police radar is in the same band as the sports radar. Laser radars or lidars were introduced in the early 1990s. These systems radiate in the upper infrared band and have extremely narrow beams, 3 - 4 milliradians (mR), or 0.17° - 0.23°. 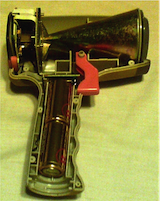 Lidars transmit a laser pulse to measure pulse round trip time (at the speed of light) to a target and back to calculate target range. Speed is calculated from the change in range with time. Laser radars are hand held and function from a stationary position only, no moving mode, and measure speed and range of approaching or receding traffic. Laser radars can also measure the range of stationary objects. Lidars have shorter detection range and are much more sensitive to weather conditions than microwave radars. Laser signals propagate best in clear dry cool atmospheric conditions. Police microwave radars do not require the operator to aim exactly at a particular vehicle, only the general direction plus or minus half a beamwidth (± 4° to ± 10°). These radars are most effective in light to moderate traffic at short and long ranges. Many microwave radars can operate from a moving patrol vehicle. Police laser radar must be aimed exactly using crosshairs or aim dot at at flat surface on a particular vehicle. These radars are most effective at short ranges in light or dense traffic. Laser radars are not designed to operate from a moving vehicle. 1.) - Lidar should not be operated from behind glass / windshields etc.